Greenville, NC Bojangles'® Tands, INC. Store #5 - Bojangles'® / Tands, Inc.
It’s Bo Time! Just because you’re in a rush doesn’t mean you have to sacrifice good food. Our Greenville Bojangles’® offers delicious food and friendly, fast service. The Bojangles’® menu is famous for favorites like our Cajun fried chicken, fresh buttermilk biscuits, Dirty Rice® and other fixin’s. 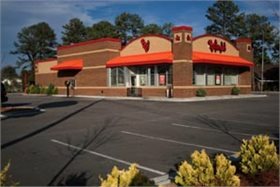 Located near the Greenville Mall (formally known as Colonial Mall) and Arlington Village on Greenville Blvd, this Bojangles’® is smack-dab in the heart of a popular retail area. We’re a popular resting spot for hungry Greenville shoppers to fill up on the food they crave. Visit the Greenville Bojangles’® today at the address below!